One of the things I love about the SCA is how generous it is. We give our time to others when we teach. We welcome new comers with clothing or trinkets. We celebrate artists with a small item. I really enjoyed the time I spent as a Baroness, especially when I was able to give things, sometimes that was an award or a trinket or a tourney prize. Well those gifts have to come from somewhere and I have been refilling our Baronial coffers this past year. 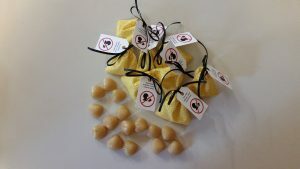 I melted down a large chunk of beeswax and made small shapes to use with hand sewing. I made a lot, then I made bags and tags for them. I used the same mold to make crayon shapes for kids. 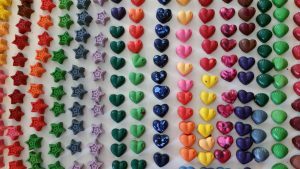 I melted down a huge pile of old crayon nubs and poured them into candy molds. (In case you are wondering; soaking off old labels in water is the fastest way to remove the grimy half torn crayon label.) I was very picky about the type of crayon melted down, so that there would not be melted wax all over the back of somebody’s car. Every time I made dinner or wandered through the kitchen I poured an other batch. I did not realize how many I made until I looked at the pile all spread out on the kitchen counter. 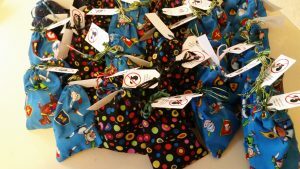 I made well over a hundred small bags and put at least 6 different colors in each bag, plus a do not eat tag. A successful, cheap and fun project for multiple gift baskets. When I find an idea that I like, I usually make a batch. 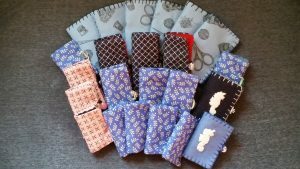 I have really enjoyed making needle books. My favorite have been the small blue books with the white Spike. All in all each one takes about 1 hour and I think I have made over 50. They are one of those small projects that you can do while sitting in front of the TV, when you do not want to start a bigger project. Soon I am going to have to stop that.